From its headwaters near Bloomington, Illinois, the Sangamon River flows through the cities of Decatur and Springfield on its way to meet the Illinois River. 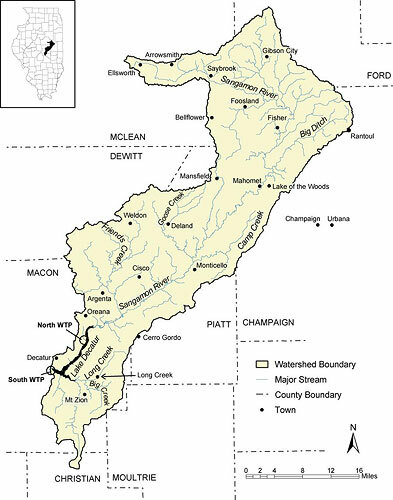 The Upper Sangamon River Watershed covers about 1425 square miles. The Lake Decatur dam, built in the early 1920s, impounds the Sangamon to create a lake used for recreation and the city’s domestic and industrial water supply. The watershed area upstream of the dam is about 925 square miles. Decatur businessman A. E. Staley played a significant early role in transforming the agricultural landscape of Central Illinois and much of the Corn Belt when his company opened a “plant for grinding and extracting the oil from the soya bean” in 1922. In the decades that followed, farm mechanization and inorganic nitrogen fertilizer helped drive land use change. By 1970, diversified small farms with corn, small grains, pasture, and livestock in the Upper Sangamon had evolved into larger farming operations producing corn and soybeans. Today, the nearly level to gently sloping prairie soils that occupy most of the Lake Decatur watershed are used almost exclusively for annual row crops, which account for about 87 percent of total acreage. Woodlands and pasture are located mainly on slopes and bottomland along the Sangamon River valley and its tributaries. Scattered tracts of native grasslands are found in public nature preserves or private lands managed for wildlife and conservation. Macon County, with over 300,000 acres of cropland, had only about 3,500 acres enrolled in the Conservation Reserve Program as of 2007. Despite the generally flat topography, erosion and deposition of sediment in Lake Decatur has been a problem since the lake was first built. The City of Decatur is in the middle of a phased dredging program to restore reservoir capacity. Much of the cropland in the watershed is tile drained. High nitrate concentrations in the lake have been a recurring problem since the early 1980s. Decatur constructed an ion exchange treatment facility to ensure compliance with the drinking water standard. Since 1984, Decatur has provided financial support for erosion and nutrient reduction practices through the Macon County Soil & Water Conservation District. In 2003, the Agricultural Watershed Institute was established as a research and educational nonprofit with the Upper Sangamon as its home watershed. Recognizing the benefits of continuous living cover (CLC) and the Green Lands Blue Waters theory of change, AWI joined the Consortium in 2005. Protecting water quality has been a major driver for CLC on working lands in the Upper Sangamon watershed. The main strategy pursued so far has been perennial biomass. The collaborative Local Bioenergy Initiative led by AWI is described on the next page. The Initiative is beginning to promote use of perennial biomass for forage as well as bioenergy. Efforts to promote cover crops are increasing. This year, AWI and University of Illinois Extension held a cover crop field day. Extension, AWI and NRCS are working with local producers on a cover crop demonstration that includes grazing. •	 Outreach and assistance to farmers and landowners that want to begin growing perennial energy grasses. AWI and U of Illinois have small energy grass plots on the Illinois site of the Farm Progress Show. AWI has 65 acres of Prairie for Bioenergy demonstration plots on property owned by Caterpillar Inc. AWI and Extension hold field days and workshops for early adopters of biomass crops. 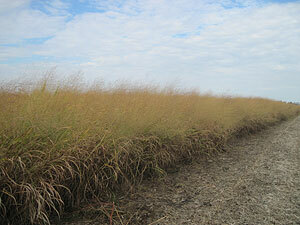 As funding permits, incentives are offered for establishment and management of biomass crops. •	Research and demonstrations of landscape design concepts for co-production of biomass and environmental benefits. AWI is working with producers and researchers on managing biomass crops to enhance water quality and wildlife habitat. Promising scenarios include stream buffers, contour plantings, wet areas, and organic field borders. With Illinois EPA funding, AWI, SWCDs, and Illinois State Water Survey are assessing water quality benefits of forage and biomass production in conservation buffers, including saturated buffers designed to remove nitrates from tile water. 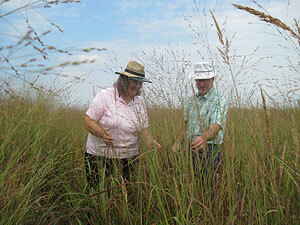 •	Collaborative efforts to develop markets for perennial grasses and ecosystem services. Market development is key to the adoption of biomass crops. The Illinois Biomass Working Group helps to coordinate market and supply chain development. 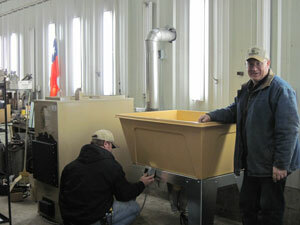 As funding permits, AWI offers cost share for biomass heating systems. Use of warm season grasses as hay or a processed animal feed product represents a potentially large market. AWI is developing a local Wildlife and Clean Water Fund and assessing policy ideas to incentivize the environmental benefits derived from production and use of perennial biomass crops.